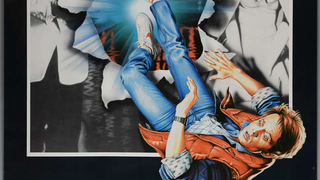 It’s almost impossible to think of Back to the Future and not instantly conjure thoughts of Drew Struzan’s iconic poster of Marty McFly stepping out of the Delorean. But we almost had a poster where the amazing time-traveling car wasn’t the star. Hell, it was barely even on the poster. This unused poster concept recently came to light after a former employee at Lonsdale Advertising in England found it in their collection, offering it to Ewbank Auctions for a series of movie poster auctions taking place in February 2016. The artist of the poster remains unidentified, all these years later. Partially because Struzan’s artwork is burned so fiercely into our minds, it’s almost bizarre to see a Back to the Future poster where the DeLorean is pushed way into the background. You can also imagine a path where the retro 50s element of the first movie would have been the focus of the advertising, rather than the technical aspects of the time travel process. Decades of pop culture success has perhaps proven that the better poster won out. After all, Struzan’s art was so beloved the concept was reused and tweaked for the main posters for Back to the Future Part II and Part III. This newly discovered post is still a very nifty, rarely seen piece of Back to the Future history. Part of history you can own, too: Ewbanks is estimating the sale of the 27 x 40 inch poster at £200-£400 (that’s around $300-$600) ahead of its sale in a few months.